Category theory reduces a large chunk of math to the clever manipulation of arrows. One of the fun things about this is that you can often take a familiar mathematical construction, think of it category-theoretically, and just turn around all the arrows to get something new and interesting! Cofunctions are somewhat interesting, but they’re really just functions viewed through a looking glass, so they don’t give much new—at least, not by themselves. If we turn around a function we get a cofunction, and vice versa. But we can also do other fun things: for example, since both functions and cofunctions are relations, we can compose a function and a cofunction and get a relation. Of course, relations also have certain disadvantages compared to functions. But it’s utterly clear by now that the category where the objects are finite sets and the morphisms are relations, is very important. So far, so good. But what happens if we take the definition of ‘relation’ and turn all the arrows around? • Brandon Coya and Brendan Fong, Corelations are the prop for extraspecial commutative Frobenius monoids. I have drawn more wires than strictly necessary: I’ve drawn a wire between two points whenever I want current to be able to flow between them. But there’s a reason I did this: a corelation from to simply tells us when current can flow from one point in either of these sets to any other point in these sets. The key point is simply that you use conductive wires to connect resistors, inductors, capacitors, batteries and the like and build interesting circuits—so if you don’t fully understand the math of conductive wires, you’re limited in your ability to understand circuits in general! In their new paper, Brendan teamed up with Brandon Coya, and they figured out all the rules obeyed by the category where the objects are finite sets and the morphisms are corelations. I’ll explain these rules later. I’m sure this will be cryptic to the nonmathematicians reading this, and even many mathematicians—but the paper explains what’s going on here. I’ll actually say what an ‘extraspecial commutative Frobenius monoid’ is later in this post. This is a terse way of listing all the rules obeyed by corelations between finite sets—and thus, all the rules obeyed by conductive wires. But first, let’s talk about something simpler. 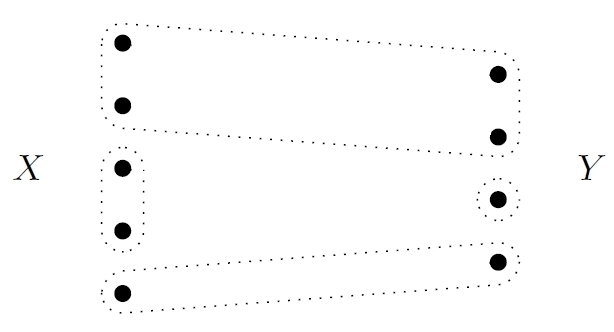 Now we have a relation described as an arrow, or really an equivalence class of arrows. Next, let’s turn the arrow around! There are different things I might mean by that, but we want to do it cleverly. When we turn arrows around, the concept of product (for example, cartesian product of sets) turns into the concept of sum (for example, disjoint union of sets). Similarly, the concept of monomorphism (such as a one-to-one function) turns into the concept of epimorphism (such as an onto function). If you don’t believe me, click on the links! This is why corelations describe circuits made solely of wires! Let me just show you the most important laws. In each of these law I’ll draw two circuits made of wires, and write an equals sign asserting that they give the same corelation from a set to a set The inputs of each circuit are on top, and the outputs are at the bottom. 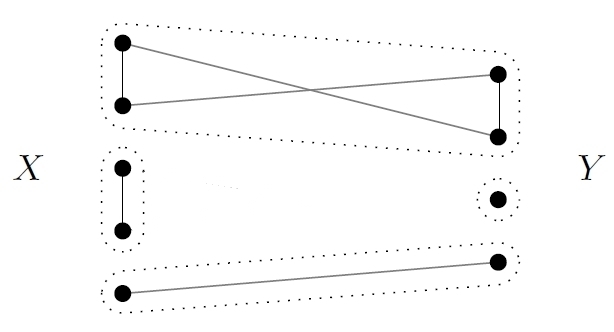 I’ll draw 3-way junctions as little triangles, but don’t worry about that. When we compose two corelations we may get a wire left in mid-air, not connected to the inputs or outputs. We draw the end of the wire as a little circle. All other laws can be derived from these in some systematic ways. • David Ellerman, Introduction to partition logic, Logic Journal of the Interest Group in Pure and Applied Logic 22 (2014), 94–125. • Fabio Zanasi, Interacting Hopf Algebras—the Theory of Linear Systems, PhD thesis, École Normale Supériere de Lyon, 2015. • K. Dosen and Z. Petrić, Syntax for split preorders, Annals of Pure and Applied Logic 164 (2013), 443–481. Unsurprisingly, I prefer Brendan and Brandon’s approach to deriving the result. But it’s nice to see different perspectives! This entry was posted on Tuesday, February 2nd, 2016 at 2:00 am and is filed under mathematics, networks. You can follow any responses to this entry through the RSS 2.0 feed. You can leave a response, or trackback from your own site. Such problems in English can be resolved with hyphenation (“co-relation”), though some people hate that. This would work better if software wouldn’t put line breaks after hyphens. Unfortunately the term “corelation” is reasonably well established, and none of the people using it have any desire to stop! I also support co-relation (with the hyphen). I became a big fan of the term because it taught me something: 1) read carefully before thinking someone’s wrong and 2) beware of “co”s in category theory! I enjoyed reading the post. I also appreciate the links to various references. I presume Brendan and you have plans for this technology. Or am I being presumptuous? You’re not being presumptuous—at least, not incorrectly presumptuous. Brendan and I already needed corelations in our paper on a compositional framework for passive linear networks, but this ‘generators and relations’ description of a PROP equivalent to the symmetric monoidal category of corelations will play a part in a new paper we’re writing with Brandon Coya and Franciscus Rebro. Jason Erbele’s thesis on control theory will also use PROPs. The overall strategy is to describe various kinds of networks showing up in applied mathematics as morphisms in decorated cospan categories, but also give general and relations descriptions of PROPs equivalent to these decorated cospan categories. This post has the same effect on me as the one on operads and phylogenetic trees. It looks familiar but I don’t understand it because I don’t understand category theory. The most important partitions that occur in my work are partitions of individual organisms into sets called ‘species’. I often think of these partitions in terms of trees. 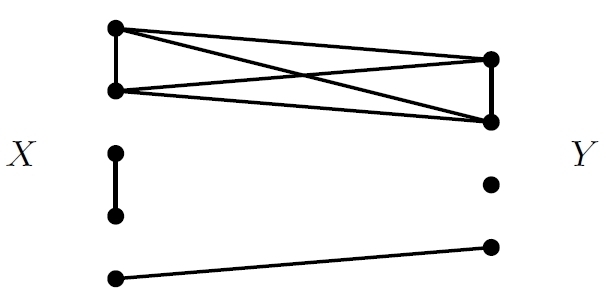 In the diagram of the lattice of partitions of a set, each path from any node X up to the top represents a binary tree whose tips are the subsets in the partition at X.
 discusses the interplay between the two monoidal operators and the span/cospan dichotomy over Set, while  basically discusses the same situation, yet wrt. Graph. More to the point, it seems to me that in  we call equivalence relations what you call corelations, and we have the same extra and special laws. Check e.g. Table 1, axioms 1 and 5. Thanks! I’ll take a look at your papers. Actually Brendan and Brandon’s paper cites the first of the two papers you mentioned here. I talked to Brendan and he said you list all the laws implicit in the phrase ‘extraspecial commutative Frobenius monoid’, and prove that obeys these laws, but don’t prove that all the laws obeyed by can be derived from these. If so, you essentially got a symmetric monoidal functor from the PROP for extraspecial commutative Frobenius monoids to but didn’t prove it’s an equivalence. I am very excited by the novel applications and connections that you are pushing, and looking forward to more results in the future. • G. Darbo, Aspetti algebrico-categoriali della teoria dei dispotivi, Symposia Mathematica IV (1970), Istituto Nazionale di Alta Matematica, 303–336. It’s closely connected to Brendan Fong’s thesis, but also different—and, of course, much older. According to Grandis, Darbo was the first person to work on category theory in Italy. He’s better known for other things, like ‘Darbo’s fixed point theorem’, but this piece of work is elegant, and, it seems to me, strangely ahead of its time. The paper’s title translates as ‘Algebraic-categorical aspects of the theory of devices’, and its main concept is that of a ‘universe of devices’: a collection of devices of some kind that can be hooked up using wires to form more devices of this kind. Nowadays we might study this concept using operads—but operads didn’t exist in 1970, and Darbo did quite fine without them. • Corelations in network theory, 2 February 2016. My student Brandon Coya has finished his thesis! However, in what follows I’ll stick to less fancy stuff: I’ll just explain the basic idea of Brandon’s thesis, say a bit about circuits and ‘bond graphs’, and outline his main results.